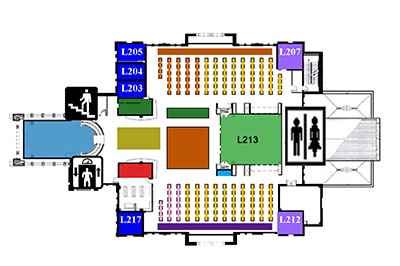 The first floor of the library can be accessed from doors located on both sides of the library building. Wireless access is available for students, staff, and faculty throughout the entire library by logging in with an OLLU username and password. Guest wi-fi access is NOT available. 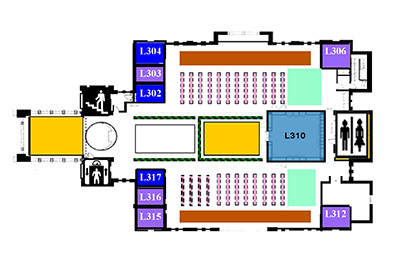 The Community Room can be found in room L100 on the first floor. 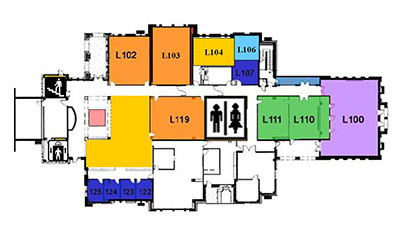 The Writing and Tutoring Centers can be found in room L101 on the first floor, across from the stairs and elevator. This is where you can find writing and citation assistance, as well as tutoring in a variety of subjects. The 24-Hour Lab is a computer lab available for student use 24 hours a day. It can be found in room L110 on the first floor and accessed using your OLLU ID. The Technical Writing Lab can be found in room L111 on the first floor. The library's technical services department, including cataloging and acquisitions, can be found in room L119. Find more about the Librarians who work in this department on the library's Staff page. The library's administrative department can be found in room L107. Find more about the Librarians who work in this department on the library's Staff page. Double staircases lead up to the main/second floor of the library from the J.E. and Le Mabee Foundation Inc. Great Hall Foyer. Located on the right as you enter the library's second floor. You can check out materials or get reserve items here. Located on the left as you enter the library's second floor. Get research assistance or ask us a question here. The Information Skills Lab is where Reference Librarians teach library instruction classes. When not being used for class, OLLU students, faculty and staff may use the lab computers. The library's youth collection is located on the second floor. It is organized by the Dewey Decimal Classification System. The library's media collections are located on the second floor and are available to check out. Read more about our circulation policy, including how long you can check out media items, on our Library Policies page. The library's current print journal collection can be found on the second floor. Print journals are organized in alphabetical order. There are four ADA accessible computers located on the second floor. The third floor of the library is a quiet study zone with plenty of space for independent study. Please keep conversation to a minimum on the third floor. Print books that are available to check out are located on the third floor. These are organized by the Library of Congress Classification System. Graduate Study Carrels are located on the third floor. These can be checked out by Doctoral students and MA English students writing theses. Find out about checking out a study carrel at the Ask A Librarian Desk on the second floor.